News Wednesday— St. Patrick Wasn’t A Drunk | What's Next God? Good afternoon readers! It is News Wednesday and St. Patrick’s Day. I know that today for a lot of the world is a day of drunkenness and partying. Well readers I found a great story I want to share with you and that I found here. Enjoy! St. Patrick was a MISSIONARY! Do your kids know that St. Patrick was a missionary? All throughout the month of March, we should remember the real missionary story of St. Patrick. Whenever we see GREEN decorations (in stores, restaurants, etc. ), we can use these as sporadic “reminders” to teach our children we’re all called to GO and to share God’s GOOD NEWS. Patrick was the first Christian missionary to Ireland. In the United States, celebrations include city parades, Irish cultural celebrations, and the wearing of green. “Saint” Patrick (389 – 461 AD) actually went to Ireland twice – first as a slave, and later as a missionary. Born in Britain, Patrick is widely known as the first Christian missionary to the Irish people. During his youth (from 16 to 22 years old), he was captured and taken to Ireland. While there, young Patrick repented of his sinful, backslidden condition. Years later, after escaping to his homeland, he received a vision from God calling him to return to the Irish people to proclaim the Gospel of Christ. Patrick obeyed God’s call and went back. For the remainder of his life, Patrick ministered among the unreached tribes of Ireland – confronting Irish idolatry and sorcery, converting many to Jesus Christ, and baptizing thousands of people. 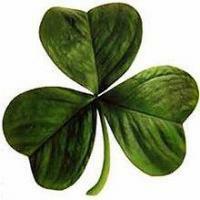 Tradition says he used the three-leaf Irish clover to teach the unity of the Father, Son, and Holy Spirit. According to historian William Federer, who wrote St. Patrick: The Real History of His Life, From Tragedy to Triumph, “He was actually a missionary and he converted 120,000 druids from paganism to Christianity.” Federer claims that in the fifth century A.D., Patrick did more than perhaps anyone in history to spread Christianity in Europe. Although druids attempted to kill him over a dozen times, Patrick continued to prech the message of Jesus Christ, and throughout his ministry he pioneered over 300 Christian churches. Patrick also spoke out against slavery, and because of this, some call him the world’s first abolitionist. For more of the article click the link above. So readers, I hope you have/had a great St. Patrick’s Day. I hope you learned something. I did.